We pride ourselves on fast, reliable service call response. Exclusive distributors of the art of flowing tea, once discovered never forgotten. 0% INTEREST FREE FINANCE AVAILABLE ON ALL EQUIPMENT! NEW £1 COIN MECH UPGRADES AVAILABLE! The robust, delectable smell of rich coffee is one of a kind; it plays a huge role in the day-to-day lives of many, and helps us to get us through the working day. If you want to revive the senses, at home or in the office, then we at Coffee Solutions believe our extensive range of coffee makers presents the perfect coffee-based solution. Our range of machines let you choose what’s best for your home or business; we offer everything from larger high-demand machines for cafés to vending and coffee machines for offices, as well as small machines perfect for that pick up at home. We know that, whether it’s in a public facing part of your business or somewhere particularly busy like a factory floor or as part of your business, it’s important to get the right equipment. That’s where our range of commercial coffee machines comes in. Our products cater to a variety of different needs; whether for the home, office, café or factory floor, we’ll have the right commercial coffee machine or maker to meet your exact requirements. Our range of household machines give you that morning pick up, to a sophisticated after dinner drink. For high or low demand, our range of machines offer the best quality drinks and maximum returns for your establishment. 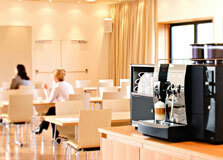 With this range of machines, your office can effortlessly enjoy a wonderful selection of Coffee shop drinks. Specially selected for the hospitality sector this range covers every aspect possible no matter how large or small. Would you like your coffee in bags with your name on? The only commitment we need from you is you order 30kg at a time. We can supply a range of quality Coffee Towers, cabinets and housings for your coffee and vending machines. Our coffee stations will enhance any office, showroom or coffee break out area.